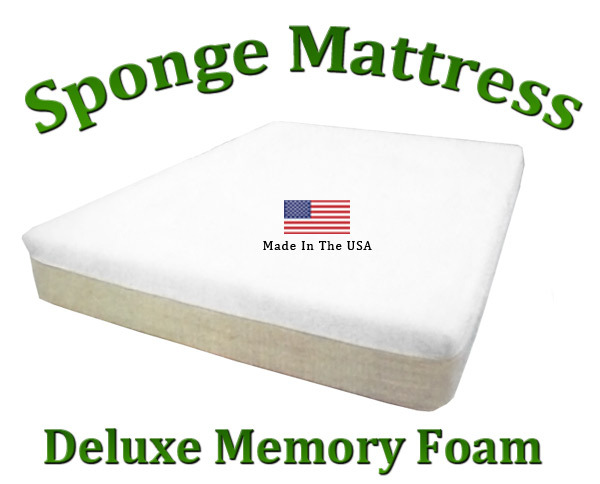 Twin Size is approximately 37" x 75" x 10"
Our sponge mattresses are made in the USA! They use memory foam or temperature sensitive foam to respond to body weight and temperature. The sponge mattress adjusts to the body's individual contours to reduce pressure on sensitive areas of the body. This sponge memory foam is the ultimate comfort material that reduces tossing and turning, giving you the ability to have a more healthful and restorative night's sleep. Memory foam mattresses are built with memory foam on top and a more sturdy foam underneath. This particular mattress had 2 inches of memory foam on top and 6 inches of sturdy foam underneath. If we used ALL memory foam, since the memory foam is temperature sensitive, you would sink to the bottom of the mattress by morning. This mattress is designed to be used without a box spring. GREAT mattress for a reasonable price! Vacuum-packed for shipping to save you money! The Deluxe Twin Sponge Mattress Memory Foam 10" Total Thickness is 10 inches thick, 1 inch of super soft deluxe foam, 2 inches of memory foam and 6 inches of sturdy foam.